The New York Giants‘ never-ending quarterback debate will need to find a resolution sooner rather than later. Early-round raft options include Kyler Murray, Drew Lock, Daniel Jones, and Dwayne Haskins. However, the Giants do not necessarily have to select a quarterback in the first two round in order to find Eli Manning‘s successor. The Giants could potentially find a quarterback in the middle to late rounds. Names such as Easton Stick have been mentioned, but recently, a new one has come up in the mix. 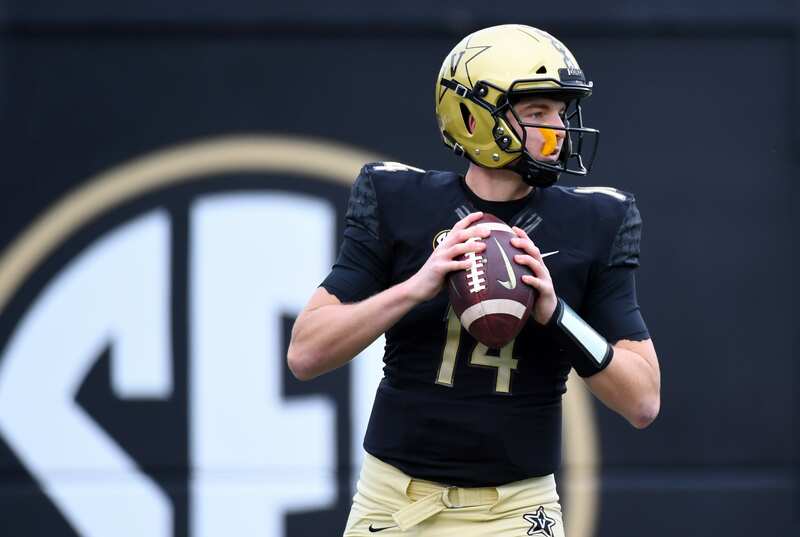 The quarterback out of Vanderbilt, Kyle Shurmur, has an obvious connection with the Giants. He is the son of the Giants’ current head coach, Pat Shurmur. Giants fans (and maybe even players, too) would definitely complain about nepotism if the Giants passed on a first round quarterback and chose Kyle in a later round instead. However, Shurmur is a developmental player with decent potential. One thing that scouts and coaches in the NFL love is a player with a high football IQ. It is common for teams to test players on memorizing playbooks at the Scouting Combine and other events. This week, at the NFLPA Bowl, Kyle Shurmur impressed scouts. He was a late entry in the bowl game, so he did not have as much time to study the playbook as the rest of the players who participated. However, he learned the playbook as well as any of his other teammates and reportedly did a “fantastic job.” This demonstration of a high football IQ could move Shurmur up the rankings for the 2019 NFL Draft. Kyle Shurmur played four years of college football for Vanderbilt. He struggled in his freshman and sophomore seasons, but showed improvement in his final two years. In his junior year, Shurmur tossed 26 touchdown passes to only 10 interceptions. He also gained 2,823 passing yards with a 57.9% completion percentage. Not a monster season, but a quality season to begin to draw scouts’ attention. Shurmur’s senior season was by far his best. He improved his passing yardage total to 3,130 and brought up his completion percentage to 62.6%. Kyle also threw 24 touchdown passes to only 6 interceptions. An excellent touchdown to interception ratio which demonstrates Shurmur’s advanced football IQ. The Giants brought Pat Shurmur in as their head coach for a specific reason: he is an offensive guru. Some consider him a quarterback whisperer because of his work with Nick Foles and Case Keenum in their best seasons. He has a way of getting the best out of his players from the quarterback position. It is possible he could get a lot out of his son Kyle if given the opportunity. Since the Giants would not have to spend a high pick on him, they could draft Kyle Shurmur late in the draft and develop him as their next starting quarterback.